The Los Angeles-Long Beach, Calif., metropolitan area has the nation’s largest Hispanic population—5.7 million—and alone accounts for more than one-in-ten (11%) Hispanics nationally.3 All population estimates presented in this report are for Hispanics living in the 50 states and the District of Columbia. The New York-Northeastern New Jersey metropolitan area is the second largest by Hispanic population (4.2 million) and is home to 8% of Hispanics nationwide. Six of the 10 largest Hispanic metropolitan populations are in just two states. California has three–Los Angeles (#1), Riverside-San Bernardino (#4) and San Francisco-Oakland-Vallejo (#10). Texas is also home to three of the 10 largest Hispanic metropolitan areas—Houston-Brazoria (#3), Dallas-Fort Worth (#6) and San Antonio (#9). 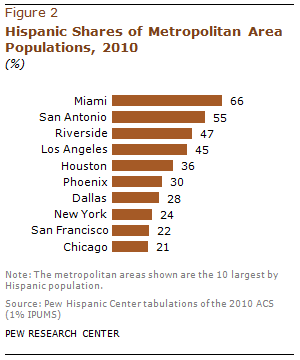 The other four largest Hispanic metropolitan populations are New York (#2); Chicago, Ill. (#5); Miami-Hialeah, Fla. (#7); and Phoenix, Ariz. (#8). Overall, each of the 10 largest Hispanic metropolitan areas has a Hispanic population of more than 1 million and Hispanics are the largest minority or ethnic group in each. 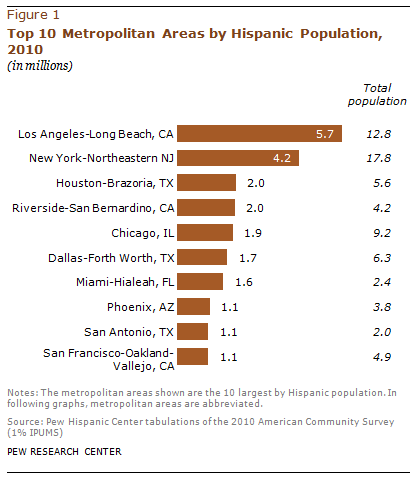 While these 10 metropolitan areas represent the largest Hispanic populations, within each area, the Hispanic share varies, as do the characteristics of the Hispanic population that resides in each area. For example, the Hispanic share in each of the 10 largest metro area populations ranges from a low of 21% in Chicago to a high of 66% in Miami. Miami and San Antonio (55%) are the only two metro areas among the 10 largest where Hispanics are a majority of the population. Among the top 60, Hispanics are a majority in 11 additional metropolitan areas. Overall, Los Angeles and New York have the largest Hispanic populations. In Los Angeles, Hispanics make up 45% of the area’s residents. In the New York metropolitan area, Hispanics make up about one-in-four (24%) of all residents. Among the 60 metropolitan areas with the largest Latino populations, two have Latino population shares above 90%. The population of Laredo, Texas—with the 36th largest Latino population—is 96% Latino. The McAllen-Edinburg-Pharr-Mission, Texas, metropolitan area—which has the 13th largest Hispanic population—is 91% Latino. The Hispanic origin composition in the top 60 metropolitan areas also varies. For example, Cubans are the largest Hispanic origin group in Miami and make up more than half (54%) of all Hispanics there. In the Washington, D.C./Maryland/Virginia, area—the 12th largest Hispanic metropolitan population—the largest Hispanic origin group is Salvadoran, making up 34% of the area’s Hispanic population. Puerto Ricans are the largest Hispanic origin group in Philadelphia, Pennsylvania/New Jersey—the 24th largest Hispanic metropolitan area—making up more than half (53%) of all Hispanics there. Mexican-Americans are by far the nation’s largest Hispanic origin group, comprising 65% of the total Hispanic population in the United States. They are also the largest Hispanic origin group in 50 of the 60 metropolitan areas covered by this report, and make up more than half of the Hispanic population in 46 of them. In 33 of these metro areas Mexicans are not only the largest Hispanic origin group, they are also bigger than any other racial or ethnic group. This report examines the Hispanic populations in the United States’ 10 metropolitan areas with the largest number of Hispanics. It also contains detailed information on the next 50 largest metropolitan areas by Hispanic population. The data for this report are derived from the 2010 American Community Survey (1% IPUMS), which provides detailed geographic, demographic and economic characteristics for each group. Accompanying this report are statistical profiles of the 60 largest metropolitan areas by Hispanic population. Each statistical profile describes the demographic and economic characteristics of the Hispanic, non-Hispanic white and non-Hispanic black populations in that metropolitan area. Also accompanying the report are two interactive maps. The first shows key characteristics of the Hispanic population in each of the nation’s 60 largest Hispanic metropolitan areas. The interactive also shows the largest Hispanic metropolitan populations and shares for the six largest Hispanic origin groups—Mexicans, Puerto Ricans, Salvadorans, Cubans, Dominicans and Guatemalans. The second interactive map shows the distribution of the six largest Hispanic origin groups across the nation’s more than 3,000 counties. The authors thank Paul Taylor and Mark Hugo Lopez for editorial guidance. Lopez and Rakesh Kochhar provided comments on earlier drafts of this report. Lopez checked numbers in the report. Molly Rohal was the copy editor.